Daniels Real Estate, the developer of Gridiron Condominiums, announced today a new homeownership campaign to make purchasing a downtown condominium a little easier for homebuyers and households earning under 115% of Area Median Income. Located at 590 1st Avenue in Pioneer Square, Gridiron is a collection of 107 homes with a decidedly contemporary design and expansive views of the Puget Sound, Olympic Mountains and cityscape. 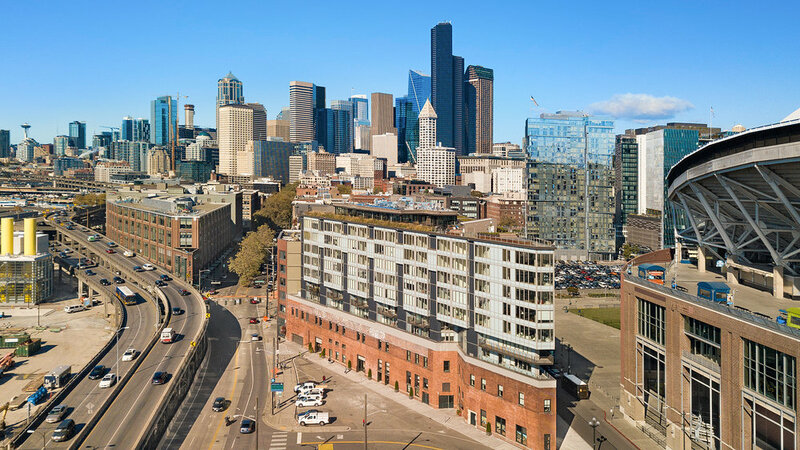 As part of a sales and purchase agreement with King County for the historic Seattle Plumbing Building, Daniels Real Estate agreed to set aside 12 residences at a restricted price for modest-income households earning under 115% of Area Median Income. An individual’s gross income can’t exceed $86,000 and a family gross income can’t exceed $98,440. The 12 homes include a mix of studio and one-bedroom residences with prices starting at $350,890. In addition to the twelve moderate-income units, Daniels Real Estate and HomeStreet Bank will kick off a special financing offer for all homes that fall within a conforming loan limit ($667,000) with a 3.5 percent down payment option and mortgages starting at 2.5 percent, second year mortgages at 3.5 percent and then third year through remaining term at just 4.5 percent interest rates. Under these unique terms an urban one-bedroom home (650-sq. ft.) offered at $566,900 would require less than $20,000 down payment (plus closing costs) and first year monthly payments of $2,162 including principal and interest. To receive this special rate, a buyer must reside at Gridiron and contracts to purchase must be mutually accepted by November 30, 2018 and closed by the end of the year. Approximately 40 recently-completed residences remain available at the boutique community which includes the restoration of the century old Johnson Plumbing Building. Daniels hired the award-winning firm Hewitt Architects to design the new homes with steel and glass, blending historic masonry with modern architecture that has resulted in a legacy building worthy of Pioneer Square. Pioneer Square based interior designer Jennie Gruss created industrial-chic urban one, one and two-bedroom flats and lofts (622 – 1,726- sq. ft.). Each home offers light-filled interiors, expansive window walls, engineered hardwood flooring and European-inspired kitchen with quartz countertops and gas cooking. Amenities include concierge services, bike storage, on-site parking, and a penthouse club area with a wine nook, exhibition kitchen, fitness center, dog commons, and outdoor terraces offering spectacular views of Puget Sound, Olympic Mountains and downtown Seattle landmarks. Gridiron is enviably located within walking distance of King Street Station – the regional transportation hub for both Sound Transit’s Sounder commuter trains as well as LINK light rail service Sound Transit 3 – a $55 billion regional expansion that will further connect Pioneer Square to the greater metro area and downtown Bellevue. In 2019, a new pedestrian promenade connecting the Stadium District to the waterfront will be located alongside Gridiron, bringing more outdoor amenities within walking distance.